Wedding bands have been used throughout the world and every culture as a symbol of love. Rings have long been a symbol of friendship, love, and marriage. Over the ages, wedding rings have evolved from talismanic rings, to tokens of love and affection, to symbols of long-term commitment. 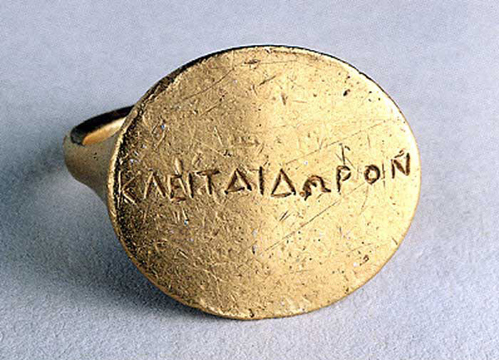 An ancient Greek love ring inscribed “Present to Kleta” (c. 4th century B.C.). 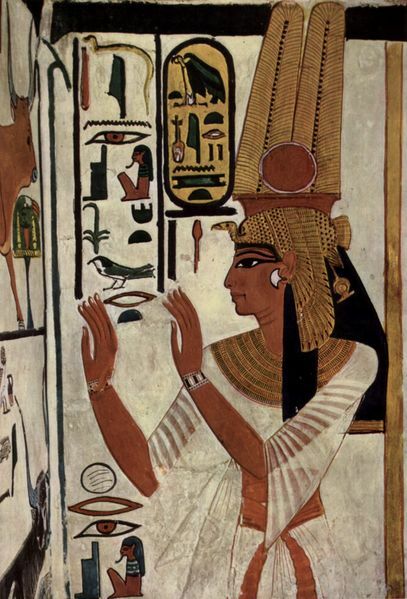 This wall painting of Queen Nefertari shows her wearing bracelets, which, like rings, were thought to symbolize eternity. Modern wedding ring traditions have their distant roots in ancient Egypt, where reeds and rushes growing along the banks of the Nile River were woven into rings and bracelets. These items were given as gifts and worn as amulets, which brought the wearer good fortune and long life. The circle created by the bracelet or ring symbolizes eternity, as it has no beginning and no end. 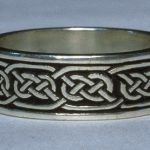 Rings and bracelets were also fashioned out of leather, bone, glass, pottery, and even metal–for those who could afford it. We have only to examine ancient Egyptian carvings and paintings to see many examples of rings from the period. 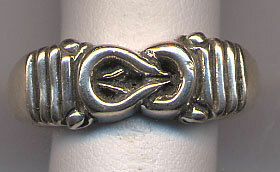 An example of the Heracles knot cast in a silver ring. The Egyptians also used an exceptionally strong knot created by two intertwined ropes as a healing and fertility charm. The Greeks referred to them as Heracles knots because of their affiliation with the Greek hero known for his strength, virility, and courage. Heracles wearing the skin of the Nemean lion. Apparently, Heracles used one of these knots to fasten the skin of the Nemean lion around his neck. 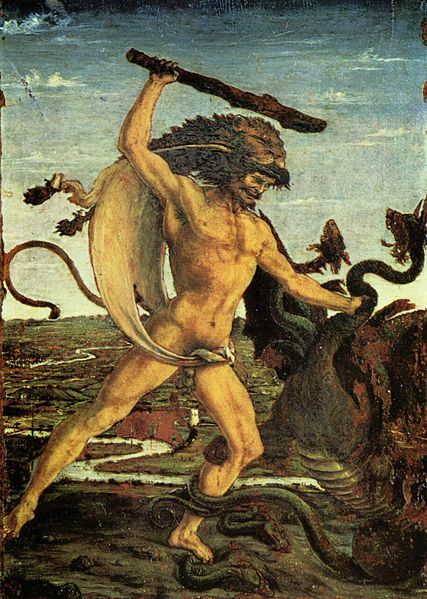 Heracles is often depicted wearing the skin of the lion, which he killed as the first of his famous Twelve Labors. 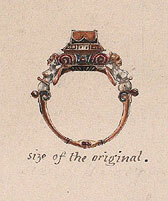 The Greeks used this motif in love and friendship rings, not marriage rings per se. 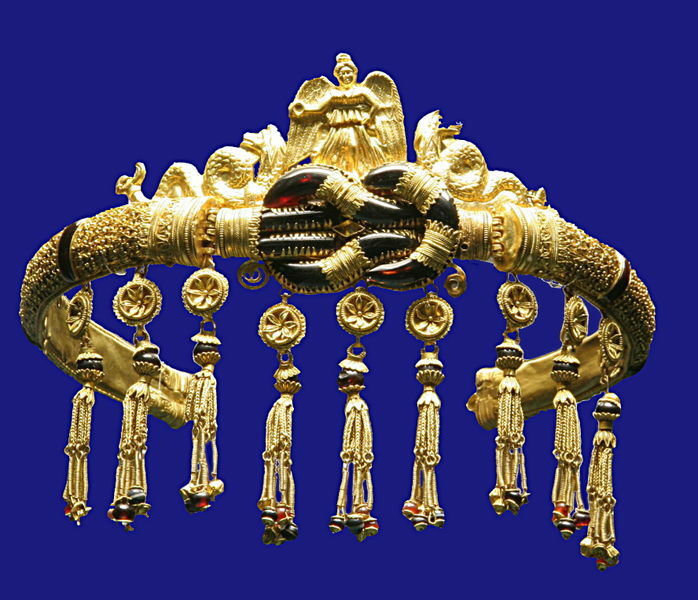 An ancient Greek tiara showing a Heracles knot (c. 300 B.C.). The Heracles (Hercules in Latin) knot was also adopted by the Romans–first as a talisman, and then as a wedding symbol when it became part of the traditional bridal girdle. In ancient Rome, the bride’s girdle was securely fastened with knots—a representation of her chastity. It was common for the groom to untie the knots in the post-wedding ceremony. This tradition has given us the phrase “tying the knot” and the knot of Hercules is now known as the “marriage-knot.” The symbolism of this knot has survived to the present day, and it was commonly used in love rings during the Middle Ages and the Renaissance. 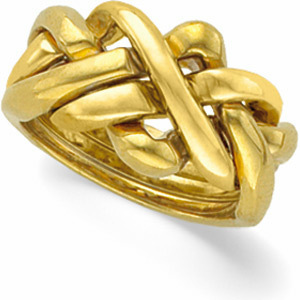 A modern ring with a knot of Heracles. The Romans were the first to introduce detailed legal requirements for prenuptial agreements, cohabitation, divorce, and of course, weddings. To marry in ancient Rome, one needed the legal right to marry, or connubium. An existing marriage precluded connubium as did certain blood and legal relationships. Generally, all Roman citizens were allowed to marry, although eunuchs were prohibited from marriage, and the aristocracy and the lower classes were not allowed to intermarry until 445 B.C. For a couple to marry, the fathers of both families were required to give their consent; the bride was required to be at least twelve years of age, and the groom fourteen. 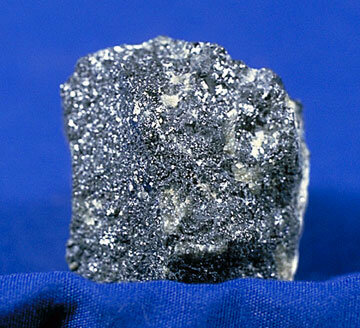 Loadstone is an ancient name for magnetite, a magnetic mineral found in ancient Magnesia. Wedding agreements or contracts were serious matters to the Romans. Once an agreement was made, failure to follow through could have serious consequences. The agreement was frequently cemented when the groom gave his intended either money or an iron ring. On occasion, the iron wedding ring was also set with a “loadstone” or magnet, which symbolized the love that bound the couple together. Like many of his day, Pliny (23-79 A.D.), a Roman scholar and author, was fascinated with the phenomenon of magnetism. He indicated that iron rings were frequently magnetized prior to the betrothal ceremony. Interestingly enough, it is still possible to buy magnetic wedding rings today. Over time, Roman “espousal” rings and other ornamental rings became increasingly elaborate. They were also fabricated from gold and other precious metals. If the ring was costly, the bride did not wear it every day. An iron ring was substituted for that purpose, and it frequently featured small protrusions in the shape of keys. Although these rings may not have been functional, they were said to symbolize a woman’s control of the valuables of the household. An ancient Roman key ring. Roman wedding rings were ornamented with different symbols or motifs. A man and a woman, representing the betrothed couple, might be engraved on the ring. If a ship motif was used, it signified happiness. Sometimes the rings featured engraved motifs such as the gods Mars and Venus, or their son, Cupid. 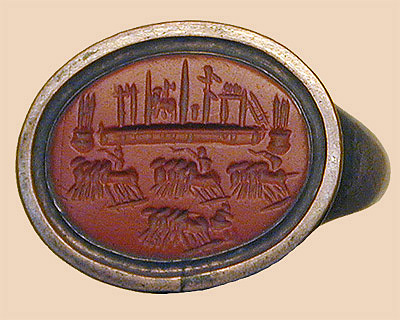 Carnelian signet ring from the 2nd or 3rd century A.D. The pagan origin of the Roman espousal ring did not deter early Christians from adopting its use. Although it was against excessive ornamentation, the early Christian Church approved the ring as a token of commitment to marriage. While the Bible does not mention rings being given as engagement or wedding rings, there is mention of the use of signet rings as a symbol of fidelity, friendship, and the delegation of power or authority. For centuries, signet rings were used to seal contracts, so it was not a big stretch to see them adapted for use in betrothal ceremonies. Other early Christian wedding rings borrowed heavily on the themes and motifs of pagan rings, but they were overlaid with additional Christian symbols including the Cross, or a depiction of Christ presiding over the union. 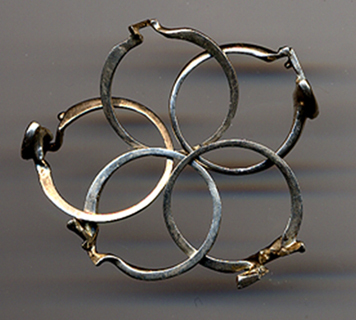 A fede ring brooch from the 14th or 15th century. Another motif frequently found in Roman and early Christian betrothal rings is a pair of right hands clasped together, representing the pledge given by the couple. 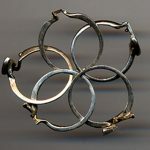 Called fede rings by 19th century collectors, this motif has enjoyed enormous popularity for many centuries, although styles have changed significantly with time. The Claddagh Ring is an outgrowth of the fede ring tradition. 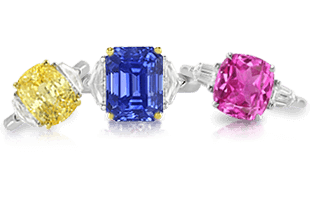 Although we know that many aristocratic wedding rings contained gemstones, they are difficult to identify with certainty as true wedding rings unless they contain an inscription. The gemstones incorporated into medieval wedding rings were often selected for the symbolism of their color, and many stones were recycled from ancient articles of jewelry. In contrast to gemstone rings, it is fairly obvious when inscribed bands called “motto rings” were used as wedding rings. 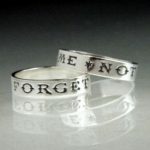 Motto rings are also known as “posey rings” because the inscriptions were known as small poems or poésies, often written in French, which was widely recognized as the language of love. Sometimes the motto was accompanied with other traditional motifs such as tears, sunrays, flowers, or twining branches. A 16th century open gimmel ring with two parts. Evidence suggests that gimmel rings were first created by jewelers in the Middle Ages. The gimmel ring is named for the Latin gemelli, meaning twins. It is comprised of two (or three) interlocking rings, which can be fitted together to look like a single ring. 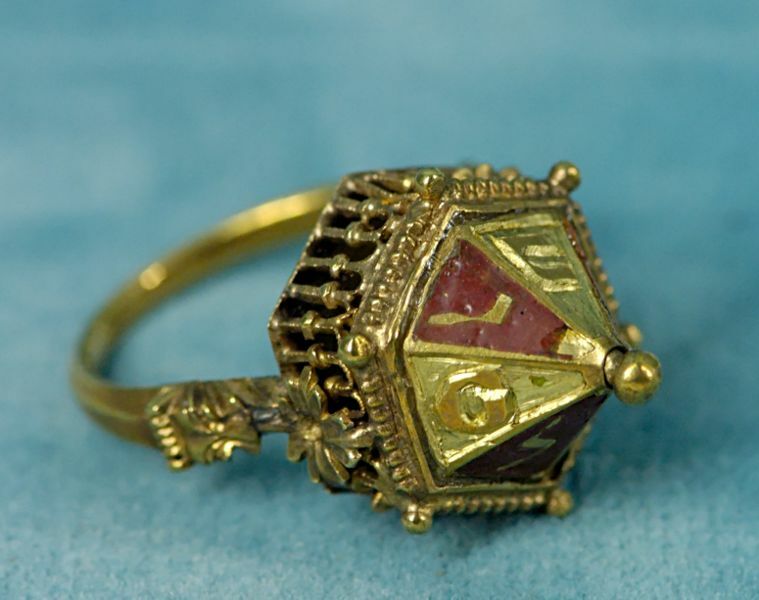 A 14th century Jewish wedding ring. It was customary to split gimmel rings into their separate components at the betrothal. If there were two sub-rings, the man and woman each took one; if there were three, a witness would hold the third. When the couple married, the three sections of the ring were reunited and worn by the bride. Gimmel rings have remained popular and have been made into a number of different styles. The wedding rings used at Jewish ceremonies in the Middle Ages and the Renaissance were not often intended for everyday use because of their large sizes. Primarily intended as ceremonial objects, these rings were intricately detailed and often took the form of a gabled building or synagogue. This enameled ruby ring with symbolic clasped hands was given by Mary Queen of Scots to her friend, an ancestor of the Earls of Mansfield. During the Renaissance and beyond, jewelry making flourished as did the other arts. Wedding rings became more elaborate and new motifs were introduced including dogs (representing faithfulness), turtledoves (representing love), wounded stags (representing the pain of love), and forget-me-not flowers. Posey rings continued to be popular and books of suitable poems were published. Old fashioned motifs such as hearts, linked hands, cupids, and lover’s knots continued to be used. In Italy, silver was favored for betrothal rings, which were often executed with niello, a kind of black enamel, which contrasted nicely with the color of the metal. 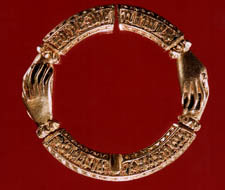 A small bracelet showing the niello technique. 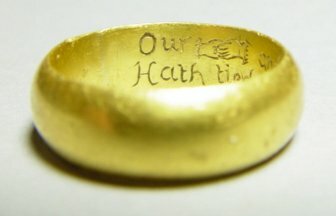 In 17th century England, the Puritan Parliament tried to abolish the tradition of the wedding ring because of its “heathenish origin.” The movement was unsuccessful. The same was attempted at different times among the Methodists, the Presbyterians, Quakers, Mennonites, and the 7th Day Adventists, each independently stressing the need for plain dress and absence of jewelry among pious adherents. 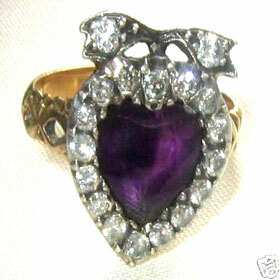 An 18th century ring with amethyst and diamonds. In each of these cases, the symbol of the wedding ring—and the desire to wear one—won out. In Colonial America, the bride was often given a thimble at the wedding instead of a ring. However, many women sliced off the tip of the thimble in order to create a ring. In the 18th century, new fashions in wedding rings emerged. The traditional band wedding ring was considered so precious to the bride that a new pair of rings was placed on either side of the band to “protect” it. 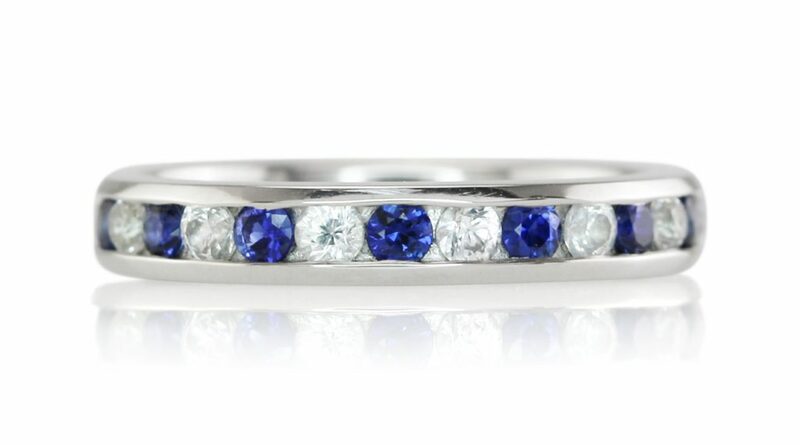 Known as “keeper rings,” these rings resemble eternity bands because many consisted of gemstones. 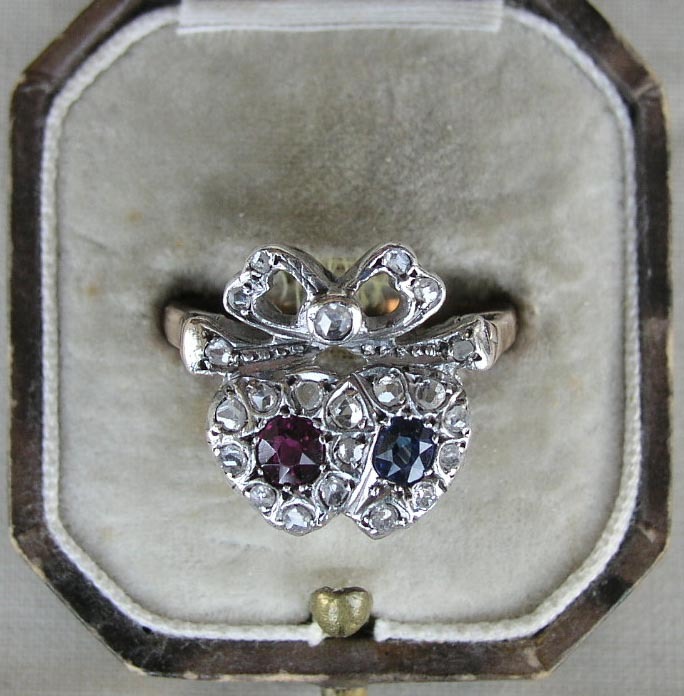 Although diamonds were often featured in keeper rings, they frequently included colored stones as well. 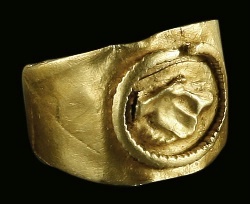 An inscribed gold wedding band and gold keeper ring. Colored stones were also incorporated into another new wedding ring design, called a “twin heart” ring. 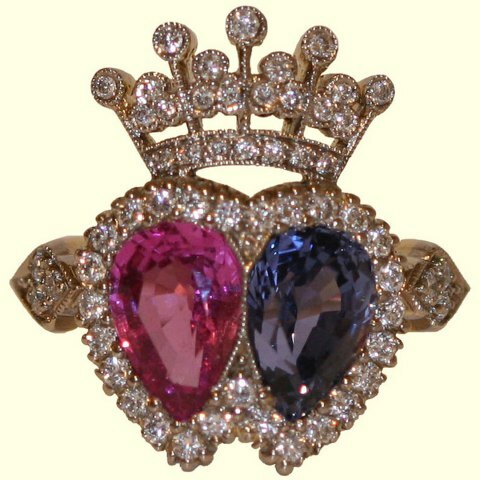 Twin heart rings were very expensive because they were frequently set with precious diamonds, rubies, emeralds, and sapphires. 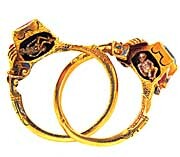 A 19th century twin heart ring. In the late 18th century, wedding rings often bore the bride’s newly assumed initials, celebrating the adoption of her husband’s last name. At the same time, a new form of motto ring became popular—the Rebus or Cipher Ring. A rebus is a puzzle in which the syllables of words and names are represented either by pictures or letters of things that sound the same. Like motto rings, many of the rebus rings were coded using the French language. For example, the letters L-L-M-E may be pronounced phonetically as ‘elle aime aimer’ (she loves to love) and the letters L-A-C-D correspond to ‘elle a cédé’ (she has yielded). Although rebus or cipher rings are known from as early as the 13th century, they became extremely popular in Victorian England. In many Victorian rebus rings the elements of the design create the puzzle. A modern version of the twin heart ring, which was enormously popular in the 18th and 19th centuries. The Victorians loved gemstones, and they employed them to spell out special words with their initial letters in “acrostic” jewelry. 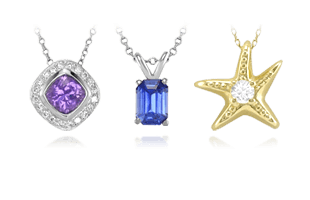 For example, a ring set with a Diamond, Emerald, Amethyst and Ruby would spell “DEAR,” or Lapis, Opal, Vermeil (a Victorian name for hessonite garnet), and Emerald would spell “LOVE.” Acrostic pieces might also spell out the wearer’s name. 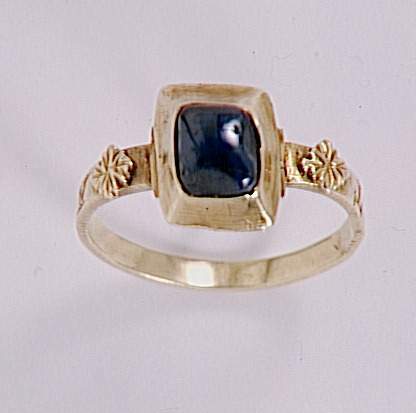 In Ireland during this period, a ring was so important that no wedding would take place without one. If the bridegroom was too poor to buy one, he had the option of renting one for the ceremony. Towards the end of the 19th century, many grooms started wearing wedding rings as well. This practice was broadly institutionalized around WWII, when soldiers, facing a lengthy separation from their loved ones, desired a token to remember them by. Also during this time, symbolic and sentimental rings, which had been so popular in the previous century, were replaced by engagement rings in the form that we know them today. Set with a pearl or the best stone the groom could afford, they signaled the bride’s intent to marry. 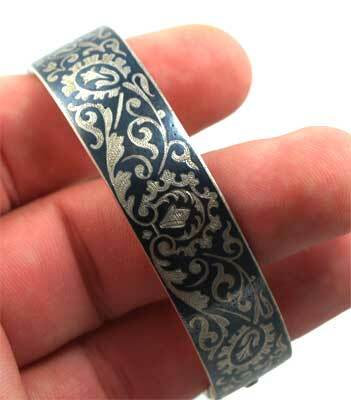 At the wedding, she and her intended would use bands inscribed with their initials and the date of the ceremony. 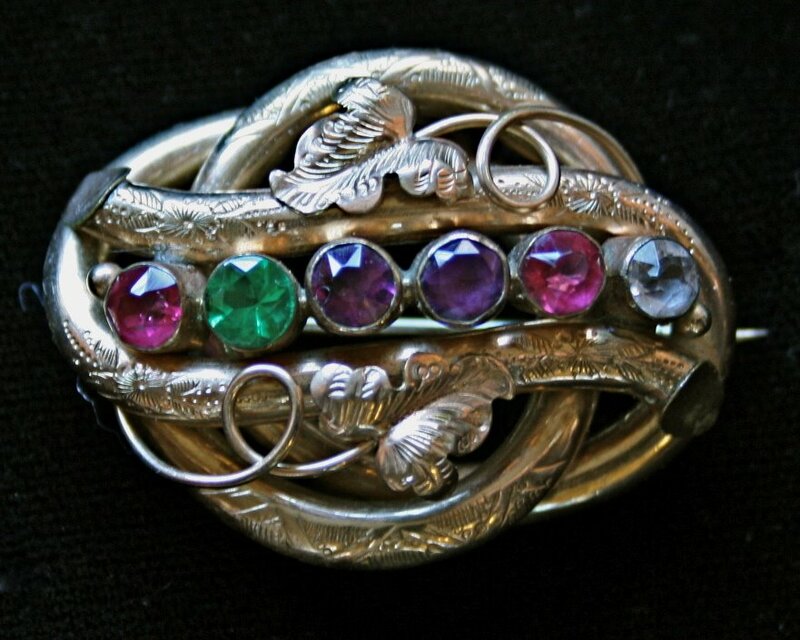 A 19th century R-E-G-A-R-D brooch. 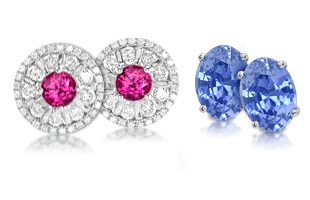 Although the discovery of large diamond deposits in South Africa in the latter part of the 19th century helped fuel the popularity of diamond engagement rings, the very wealthy often preferred colored gemstones such as ruby and sapphire. At the beginning of the 20th century, platinum jewelry became a major status symbol. It became the preferred metal for engagement and wedding rings because it does not alter the perceived color of diamonds and it is stronger than silver. 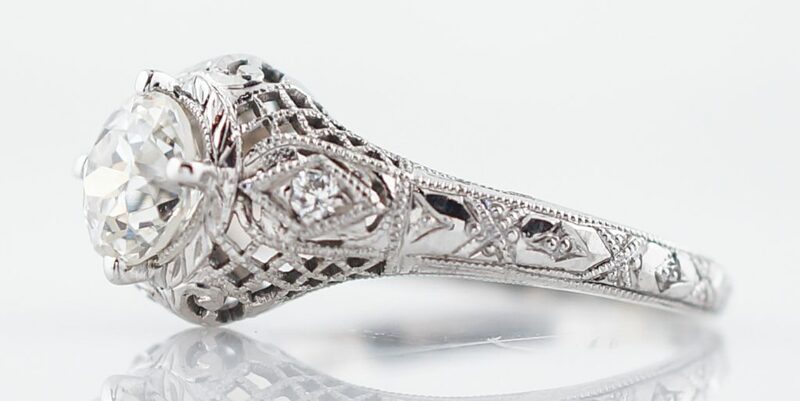 During the Art Deco period, platinum became the choice metal for wedding bands. 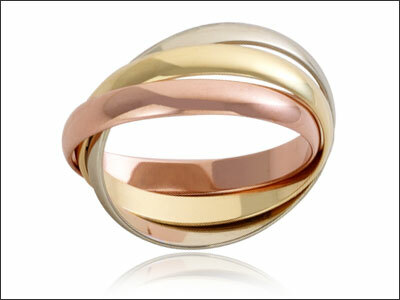 Two-tone band rings are frequently made of white and yellow gold or platinum and yellow gold. However, World War II temporarily took platinum out of the jewelry market, as stocks were reserved for wartime use. As a result, wedding rings made during the war years were made of gold. White gold, which is less expensive than platinum, has also enjoyed enormous popularity, and today, palladium, another white metal, is also gaining favor. Wedding bands and other bridal jewelry continue to be in high demand. Wedding bands have become standard articles in marriage ceremonies all over the world. In 2005, one out of sixty-two Americans tied the knot. Another estimate indicates that approximately 2.3 million weddings take place in America every year, 33 percent of them remarriages. 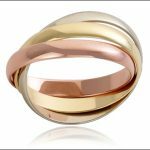 Retailers also note a trend toward sales of commitment rings, which are rings that signal long-term relationships that do not necessarily culminate in marriage. A diamond and platinum wedding band. 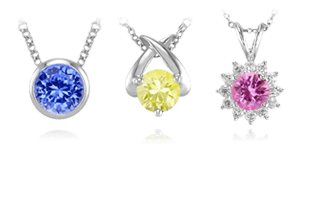 In 2006, bridal and wedding jewelry sales in the U.S. reached US $8.4 billion, up 3.9 percent from the previous year. Experts project that this market will continue to expand well into the second decade of the 21st century. 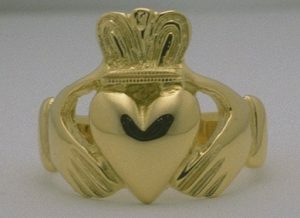 A 14-karat gold Claddagh ring. When worn on the right hand with the heart facing outward, the wearer is still searching for true love. When worn on the right hand with the heart facing inward, the wearer’s heart is attracted to another. When worn on the left hand with the heart facing inward, the wearer’s heart is promised to another forever. The Claddagh ring was designed by Richard Ioyes, a native of Galway, Ireland. In the late 17th century, Richard was captured by Algerian pirates and later sold as a slave to a Moorish goldsmith who trained him in the art of metalworking. After his release sometime around 1690, Richard returned to Galway where he created the first Claddagh ring. Earliest examples of the ring date back to the 1700’s and are stamped with the initials RI. 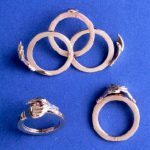 Men and women in Anatolia and Greece sometimes choose puzzle rings, which are sets of interlocking metal bands that must be arranged properly if they are to form a single ring. 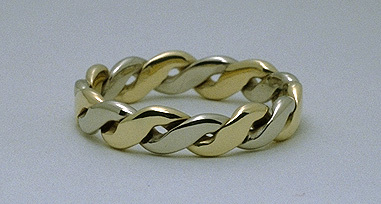 An open gold puzzle ring. In antiquity it is said that husbands gave them to their wives as a test of their fidelity since they would fall apart if they were removed from the finger. However, with practice it takes little effort to re-make the puzzle and anyone can learn to do so. 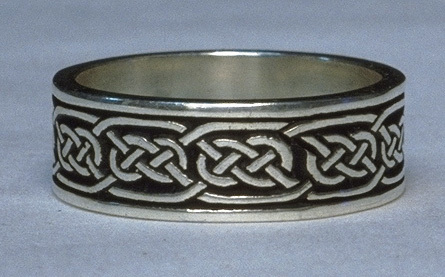 The patterns on Celtic rings date to manuscripts from the 9th century. 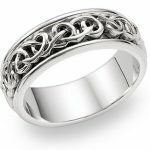 Celtic-style wedding bands have become more popular in the U.S., Canada, and other English-speaking countries with large populations with Irish or Scottish ancestry. 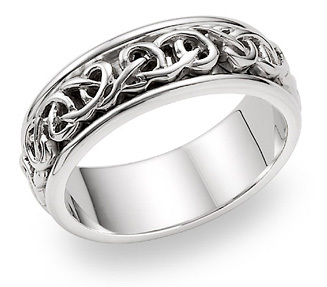 This style of wedding band is often engraved or embossed with a Celtic knot, which symbolizes infinity, continuity, and oneness. The knot is a complete loop that has no start nor end and is typically crafted using one thread per design to encapsulate the theme of eternity. Russian Wedding rings are typically composed of three interlocking bands of rose, yellow and white gold. These rings are sometimes called Trinity rings. A three-piece gimmel ring in the form of a Claddagh. The gimmel ring has been popular for centuries. It consists of two or more interlocking rings, sometimes joined by a pivot, which fit together to form a single ring. The different pieces are said to symbolize the union of two lives. 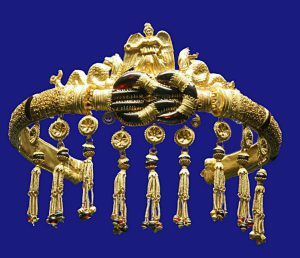 Although many of the ancient gimmel rings were extremely ornate, the more modern versions are usually streamlined. Posey rings have been used as wedding rings for many centuries. 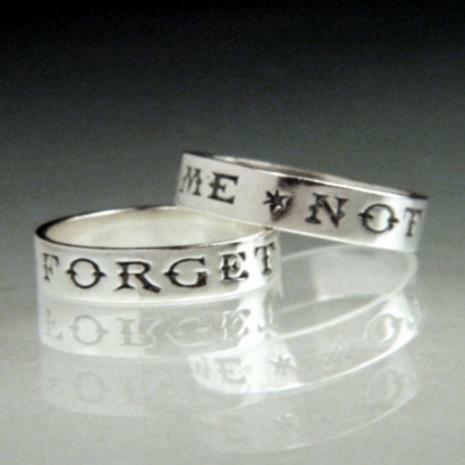 These rings are also known as “motto rings” because they are inscribed with mottos, small poems or poésies. Sometimes the poem is enhanced with other traditional motifs such as flowers or twining branches. Building on the expression of wedding bands, explore Eternity and Anniversary Bands | A Guide to History and Style next.